If you want to enter the Kawasaki Ninja family, then Ninja 250 is the most affordable option. It has been around in the market for quite some time now but Kawasaki launched an updated model last year at the Art of Speed 2018 custom show at Malaysia Agro Exposition Park Serdang (MAEPS). This is one thing about Kawasaki that we really appreciate, it keeps on updating its products when required. The new Ninja 250 is powered by a 249 cc, parallel-twin, liquid-cooled engine which has been tuned to churn out 39 horses and 23.5 Nm. The engine is more refined than before. The 6-speed slick gearbox is always ready to help you gain speeds. The Ninja 250 comes with assist and slipper clutch so you wouldn’t need to worry about the rear misbehaving during aggressive downshifts. Priced at RM 20,757, the Ninja 250 is still a great beginner’s motorcycle. Have a question on Ninja 250? Ninja 250 is available in 2 different colors - Red and Yellow. The 2018 Kawasaki Ninja 250 is one of the latest additions from the company in the Malaysian market. And it replaces the earlier Ninja 250 and the 250SL. It bears a higher craze among the enthusiasts due to the great updates it brings over the model it replaces. And indeed so, launched at the 2018 Art of Speed in July, the new Ninja 250 has a huge upgrade on its engine over the previous model. And needless to say, the Japanese two-wheeler is focusing on making the motorcycle more and more competitive each day and things start getting hotter with this baby Ninja. The price starts at around RM 23,000. 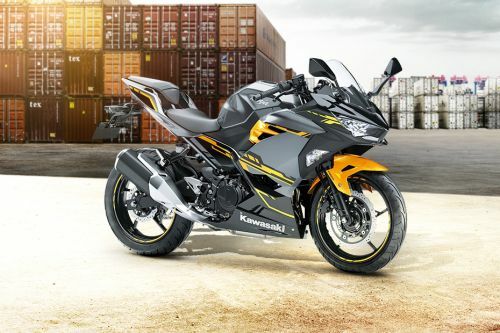 The Ninja series from Kawasaki has always been a head turner, and so is this baby, the Ninja 250. It has its styling taken from the flagship Ninja H2 and gets great attention for its large bodywork and detailing. The fit and finishing are top class too. The front section is sharp and the same can be witnessed on the chiselled full fairing and the twin LED headlamps too. The information console is the same as the one that we see on the Ninja 650 and imparts a very racy vibe. The analogue-digital console has a very tidy approach. The large dial for the tachometer will surely get the rider to want to rev the engine higher on the open roads. Further, the fuel tank is well contoured, especially in the place where the rider locks his knees. This makes for a better handling and comfort. The 2018 Kawasaki Ninja 250 is a great performer on the road, without a hint of doubt. The increase in the power delivery has seen the fun-to-ride parameter surge higher up. The engine now is much more responsive than it used to be. The peak power and torque come at a very high rev range, something that will thrill the riders who keep a tap on the tacho while riding. The seat height isn’t the highest in the segment. In fact, the 795 mm height is good enough for all riders. The overall kerb weight of 164 kilograms is also quite manageable. The motorcycle has an abundant amount of torque available at lower revs. This makes the ride equally smooth while city commuting too. Another interesting feature is the radiator fan cover, a setup that directs the engine heat away from any of the rider’s body parts. Hence, the discomfort level while idling in a halted traffic would be far lesser, besides keeping the engine bay cooler than otherwise. The 2018 upgrade on the Kawasaki Ninja 250 has seen the engine reworked and as a result, the power is bumped up a lot higher than what the previous model made. The 249 cc two-cylinder engine gets the liquid-cooling feature and four valves per cylinder. The engine is now capable of churning out a maximum power of 39 PS at a whopping 12,500 rpm along with a peak torque of 23.5 Nm at 10,000 rpm. The produced power is transferred to the wheels via a 6-speed gear unit. The 2018 Kawasaki Ninja 250 has great stopping power too. The force comes from a 310 mm disc brake up front while the rear wheel has 220 mm unit. Both the sides have dual-piston calipers for sharper feedback. Apart from this, the thick and sticky wheels help to keep the motorcycle firmly planted on the turf, even when you try to test its limits. Be it under hard braking situations or while leaning at a good angle around a corner, the wheels would prevent mishap due to skidding. The 2018 Kawasaki Ninja 250 is one of the most powerful fully-faired sports motorcycles in the quarter-litre segment. It competes directly against the Yamaha YZF R25. However, having a better engine performance is what takes it above the league of the rest. It really manages to keep up the name of the Ninja series, though being a little on the expensive side. What are the Safety Features Available in Kawasaki Ninja 250? Is Kawasaki Ninja 250 available in Electric?